Globalization is a pervasive feature of recent industrial and commercial developments, not least in the airline business with concomitant effects on human resource management. This book focuses on the organization and human resource changes that have taken place in the international airline industry in recent years. 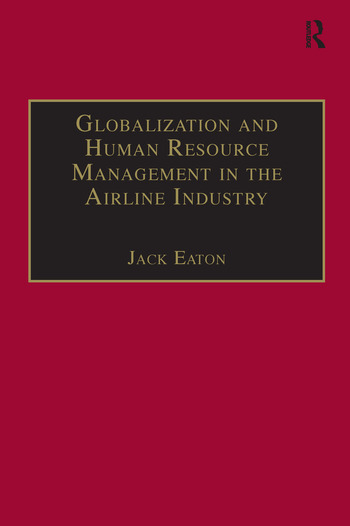 It provides an extensive analysis of airline organization and external relations, airline organization and internal relations, changes in industrial relations and human resource management and also, the integration of human resource management and other management functions. The authoritative second edition of an already established work that covers both theory and practice, this book will be of great interest to managers in all areas of the airline industry, as well as to students of air transport and personnel/human resource management. Contents: External Relations: Relations with customers; Relations with the state and human resource management in airlines; Relations with investors, suppliers, the general public and competitors and human resource management; Airline organization and external relations. Internal Relations: Theory of airline organization; Elements of airline organization. Industrial Relations and Human Resource Management: Industrial relations. Human Resource Management and Other Management Functions: Airline production management and human resource management; Finance and human resource management; Personnel management; Bibliography; Index. Jack Eaton is a lecturer and also program director of the MBA at the University of Wales, Aberystwyth, UK. He is the author of Comparative Employment Relations (Polity) and co-author of Professional Issues in Software Engineering (Taylor & Francis).